Montreux, Lausanne, and Geneva have the best Christmas markets (Marché de Noël / Weihnachtsmarkt), decorations, and lights in the Lac Léman region of Switzerland. The advent season before Christmas brings some color and holiday cheer to towns in the Lake Geneva region. Many towns will see an increase in cultural events – not all music will necessarily be religious in nature – and Christmas lights will lit up many streets and public spaces. Often, shops have the best Christmas decorations, while the odd Christmas market will invite visitors to eat, drink, and be merry. Snow in towns on Lake Geneva is possible but by in no way common in December. 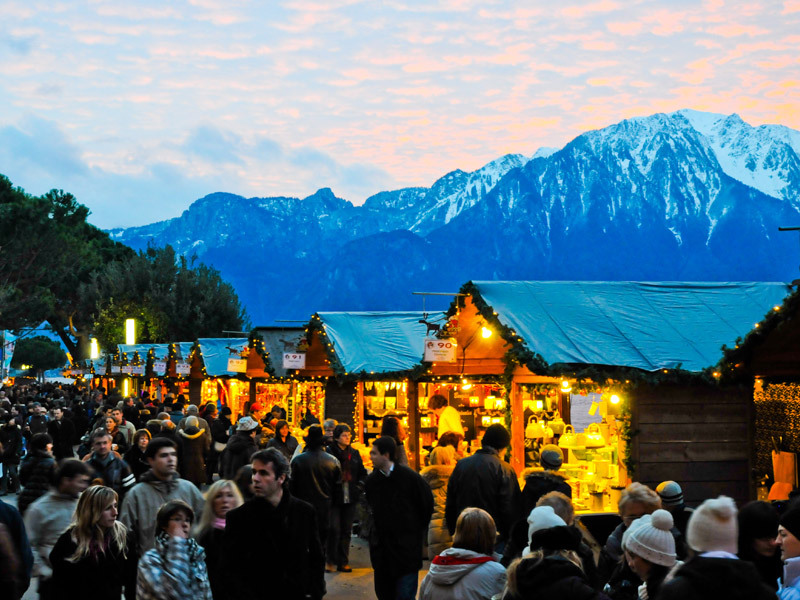 Christmas market are generally held from around November 24 to Christmas 24 but the market in Lausanne and some ski resorts continue until December 31. The Marché de Noël à Montreux is the best Christmas market in the Lac Léman region. The Montreux Christmas market is a relatively new event and with less than two decades of history cannot really compete with the centuries old traditions of many a German Christmas market. Germany, however, is three hours driving away. In 2018, the Montreux Christmas market will be open from November 22 to December 24, 2018. The Montreux Marché de Noël is spread over several distinct areas. The main market is on the banks of Lake Geneva with wonderful views not only of the lake but also the snow-covered Alps. Around 150 open-air stands here sell various trinkets as well as ample food and drink. A few rides are available too. Nearby, in the market hall, is the covered Marché de Noël with a Santa’s workshop. Each year, Montreux invites a country to do a special Christmas presentation. The Montreux Christmas market is open from November 22 to December 24, 2018. Opening hours are generally 11 am to 8 pm (10 pm on Thursday, Friday, and Saturday) and opening at 10 am on weekends. Admission is free. Transportation by train, especially over weekends, is highly advisable. A special Santa’s House on Rochers-de-Naye and a Christmas town in Caux require train reservations and admission fees. The special medieval Christmas market at Chateau de Chillon also has an admission fee but reservations are not required. Geneva likes to play up its international links and thus hosts an annual Genève Marché International de Noel at Place de la Fusterie between the old town and Lake Geneva. The market has a mix of international exhibitors and traditional pre-Christmas food from many nations. However, the Geneva International Christmas market seriously lacks atmosphere and visitors with high expectations of a traditional Weihnachtsmarkt are likely going to be disappointed. The celebrations surrounding Geneva’s L’Escalade celebrations in mid-December are often more interesting and fun. More positively, Geneva often sports some of the best Christmas decorations in the region. Rue du Marché usually have the largest displays while the high-end shops in Rue de Rive often have very classy Christmas windows too. Public spaces are often tastefully decorated too. Lausanne has an active events program during advent. The main Marché de Noël (Christmas market) is on Place St Francois where just over 50 stalls sell decorations and food. In 2018, Christmas markets in Lausanne will be open from November 21 to December 31, 2018. Music can often be heard with the “Afterworks Jazzy” particularly popular. Afterworks Jazzy can be enjoyed on most Tuesday and Thursday evenings from 5:30 to 7:30 pm on Place St Francois. More traditional chorals are also sung on the square and other venues in Lausanne. A 20-minute performance of the nativity scene (Crèche Vivante) is performed by around 12 actors on various nights in Place de la Louve. Many ski resorts also have their own Christmas markets that are often open on Christmas day as well. Many towns near the lake will have hand crafts markets on a few weekends during Advent. The indoor market next to Morges train station held mid-December is good in any weather. A very pleasant Christmas market is also held in the small village Coppet with the Chateau an important venue. the market is usually held late November, early December – in 2018 from 30 November to 2 December.